The Piolets is a well established hotel offering a professional and friendly service. It enjoys excellent leisure facilities and scenic piste views and has a superb location in the very heart of Soldeu just next to the gondola. 118. All rooms have bath with shower, balcony, satellite TV, hairdryer, minibar and safe. South-facing rooms overlooking the slopes are available with a supplement. Single rooms without balcony are available on request as are Junior Suites with mountain views. Book the Ski Inclusive Package which in addition to a lift pass and skis and boots includes lunch vouchers for 6 days for a sandwich, chips and a drink in participating restaurants on the mountain. We update Hotel Piolets's details often, but facilities do change. e.g. some extras listed by the supplier as "free" or included might only be for the first time you use them, or for one time per party, then charged for further use. If any specific feature is essential to your holiday, make sure you ask us to confirm the details of it before you book your holiday. This package holiday to Hotel Piolets in Soldeu and El Tarter, Andorra departs Sunday 22nd March 2020, for a 7 night stay on a "half board" board basis. A local tourist tax (Taxe de Sejour or Kurtaxe) is levied by many councils in European ski resorts. It varies by standard and type of accommodation and is age dependent, so not everyone is charged. It's not included in the basic price of your holiday and is usually paid locally. For reference, the average charged in winter 15/16 was between 50p and £2 per person, per night. Soldeu and El Tarter lift pass price last reported as 240 € (adult 6 day). Ask for a quote when booking Hotel Piolets. Soldeu-Maistre Hotel Soldeu and El Tarter Andorra, Dover Ferry 22nd March. 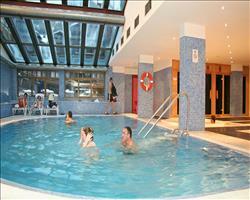 Hotel Himalaia Soldeu and El Tarter Andorra, Dover Ferry 22nd March. 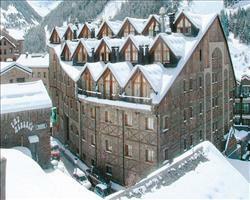 Hotel Euro Ski (E... Soldeu and El Tarter Andorra, Dover Ferry 22nd March. Piolets Park & Sp... Soldeu and El Tarter Andorra, Dover Ferry 22nd March. 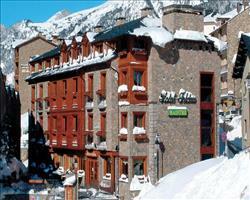 "A great holiday at the Piolets and our first time skiing Andorra." We enjoyed our week here. The location wasn’t a problem, the hotel’s minibus was fantastic and we never had to wait more than 2 minutes for it. They had 2 minibuses going for a good 3 hours in the morning and another 3 hours in the evening; because the resort was so quiet the week we went, it never took long to get around. It wasn’t too far to walk either which we did a couple of times. The lockers were ok, they were free to use although the room was quite small so we were glad we weren’t there in peak season! The hotel buffet was good quality, good for breakfasts. With the evening meals, the only drawback is that drinks were very expensive – the cheapest bottle of wine was €12 but if you go down to the local shop, you can pick up the same bottle for €2-3! So I would advise stocking up on the wine in the shop and bringing it back... Apart from that, everything was brilliant and we liked our rooms which had more than enough space.